Racist Australian men have pictures of cars on their Facebook pages. After wading through pages of racist drivel that’s the conclusion I’ve come to. A friend of mine commented on a post from Facebook group called Ban the Burqa (who I’m not going to link to) so it showed up on my Facebook timeline. 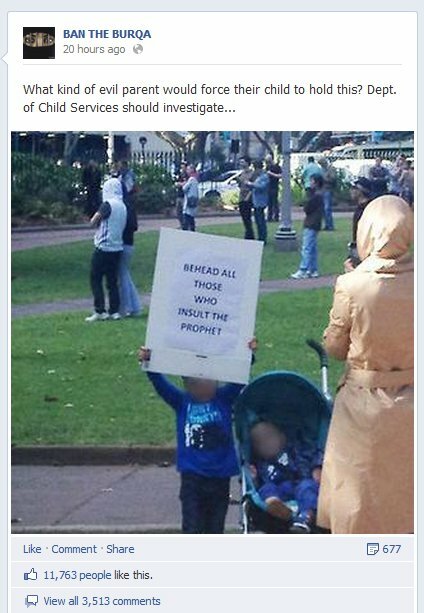 The post showed a picture of a young boy at the recent Sydney riots holding up a poster saying ‘Behead all those who insult the prophet.” I started reading the comments and found myself in a welter of ugly Australia. Thinking to do another article about why people are prepared to attach their names to horrible comments, I kept reading. There were a roughly equal number of racist comments from men and women although the men were slightly ahead. I couldn’t find any pattern in the women’s Facebook pages though, except perhaps a slight fondness for fluffy dogs. There were 82 men making overtly racist comments in my sample. Forty-four of them, or 54 per cent, had a car or motorbike featuring obviously on their Facebook page. By ‘obvious’ I mean it was clearly something that mattered to them; it wasn’t, for example, a car in the background of a wedding shot. Which leads me to the inference that there’s some connection – not so much a connection with cars, perhaps, but a connection between those who see their car as the thing to feature on their Facebook page and a propensity to make racist remarks in public forums. After looking at hundreds of Facebook pages from people prepared to post publicly racist comments the thing, apart from the car pictures, that struck me was their overall banality. These are not pages of hate-filled diatribes. They are pictures of weddings and families. The person advocating sending ‘them’ all home may have a picture of himself with his 90-year-old grandmother from Greece. The woman advocating having children put into care will have pictures of her own kids’ drawings. It’s that normality which continually drives home to me how the Internet brings me into contact with parts of my own country and city that I just don’t normally see, until our worlds collide. So do I really believe you can draw a link between racism and posting pictures of cars on your Facebook page? No, of course not. For a start I could have picked a number of other things to have my fun with – the way the posters so often got ‘their’ and ‘there’ mixed up is an obvious one. No, I can’t use my small sample and bodgy statistics to draw a conclusion about a whole group of racists. Any more than a group of racists can use a single photo or a few hundred hot-heads in Sydney to draw a conclusion about the billions of people who follow a religion. It’s simply baseless and creating a pattern where it doesn’t exist. The difference between us is that I’d be happy to show my children this article. I wonder how many of the people I looked in on today could say the same about the things they posted? I wonder how many of them have even thought through that it only takes a click to find them, to find where they work, to find which soccer team they coach. They are not anonymous. Anyway, while we’re on the subject of pattern matching. In the course at looking at hundreds of Facebook pages I noticed that the advertisements that Facebook was displaying to me had changed. I started seeing a lot of ads for cars. 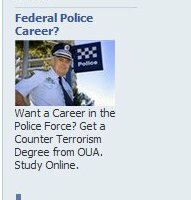 I also, and this made me laugh, started seeing an advert encouraging me to join the Federal Police. That made me smile in a way which nothing else in my morning’s reading did.